If you study music at your home university, and are curious to hear about how you can strengthen your skills while abroad, this post is for you! As a student enrolled at DIS Copenhagen, you have the opportunity to study at the Royal Danish Academy of MUSIC (RDAM), the oldest music academy in Denmark. From piano to percussion, voice and sound engineering, check out the list of music courses here. DIS: Why did you decide to take courses at RDAM while studying at DIS? Rashaad: I always knew that I wanted to study abroad in college for exposure to different thoughts and ideas pertaining to music. 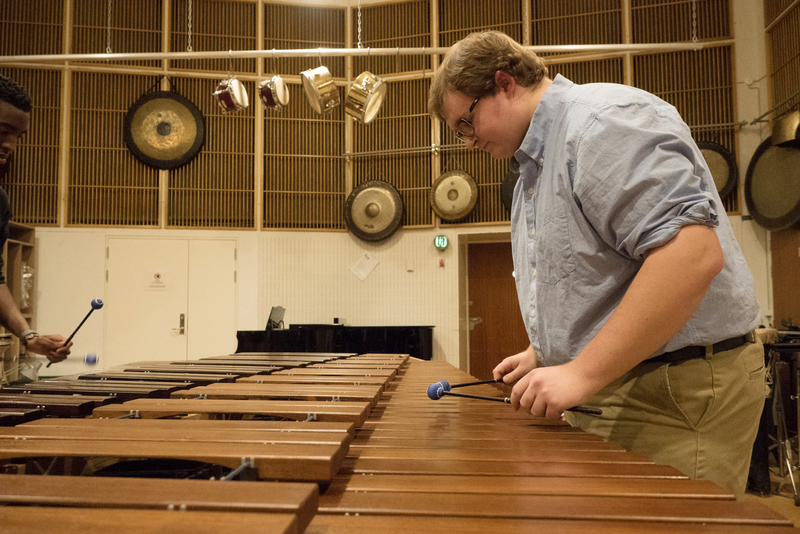 A senior percussionist who had previously studied at DIS and RDAM spoke highly of the experience. In addition, I was originally double majoring, and DIS seemed like an exceptional choice considering I could take the Positive Psychology core course while studying music at the Academy. Clark: Going into college I didn’t have any intention of studying abroad, but after hearing from one of my professors and two older percussion students how incredible the study abroad experience is, I quickly changed my mind. One of my colleagues, Liam Underwood, had studied with DIS and RDAM in fall 2014 and had nothing but good things to say about his experience. After researching the program, DIS and its partnership with RDAM rose to the top of my list because I could continue studying percussion performance at RDAM while also taking liberal arts courses at DIS to help get me closer to finishing my degree at Vanderbilt. DIS: What is your general impression of RDAM? R: I really enjoy the academy. In the percussion department, there are more rooms and instruments than back at my home university, making it easier to schedule practice sessions. Furthermore, the students and staff are very friendly and are more than willing to help me with any questions I have regarding the music school. C: The six-credit Musical Performance: Instrument course has certainly been worth it. I have three different sets of lessons with incredible professors and two orchestra repertoire courses where each week we [percussion students] play through a symphony or other symphonic pieces that a nearby orchestra is also playing that week. For example, we recently covered Shostakovich’s Tenth Symphony in class and the Danish Radio Symphony Orchestra (in Copenhagen) is performing that piece this week. Studying at the Royal Danish Academy of Music is an excellent experience and I’m very happy that DIS has a partnership with them. DIS: What is it like to take a course at an external university? R: It is not too difficult studying at two separate universities. In the beginning of the semester, I biked to commute between buildings, but now that it is colder, I simply take the bus, and transportation time is still rather short. I also purposefully scheduled my DIS courses in the same day so I only have to go to DIS twice a week, rather than four times a week. DIS: What is it like to take these courses alongside DIS courses? R: Managing my schoolwork and practice time has not been stressful. However, I do wish it was possible to have music as a core course, because the study tours take away a significant amount of potential practice hours. C: Initially the idea of actively studying at two different universities was a little intimidating, but the two programs work together really well. I basically start each morning at DIS and spend the rest of the day at RDAM practicing. Several of the courses I’m taking at RDAM are individual lessons, so I’m able to schedule those at times when the professors and I can meet. And they are pretty flexible – they are all working musicians with professional jobs in orchestras or as soloists or members of a chamber group – so we find times that work for both their rehearsal/performance schedule and my DIS schedule. When I have go on my Program Study Tours with DIS, I just let my RDAM professors know that I’ll be out of town for that week, and we work around that. DIS: How has studying at RDAM affected your study abroad experience? R: Studying at RDAM has positively affected my study abroad experience because I am learning a lot of new ideas from varying perspectives. My music professors have different approaches to music-making; therefore, I’m learning authentic material that is different from what I would learn in the United States. C: It has certainly had a positive influence on my study abroad experience. While RDAM is in Copenhagen and a lot of students are Danish, the school is also very international. The percussion studio has 35 members. Beyond the Danes, the rest of the students are from Italy, France, Faroe Islands, China, Spain, Norway, Sweden, Finland, Poland, Taiwan, and I am sure I’m leaving out one or two more! It’s exciting to see how all our different experiences relate to one another, and fortunately, everyone has been incredibly welcoming to not only me, but all the other students new to RDAM this semester. DIS: Have you made friends with locals through RDAM? C: Yes! I think it is safe to say that I have made great Danish friends, and great friends from other countries as well! 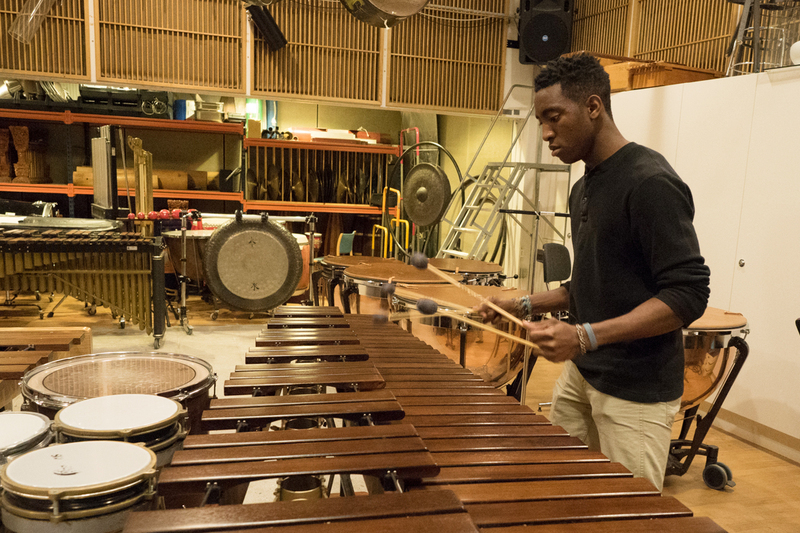 Percussionists seem to come together and create a family-like atmosphere in the studio. I see these guys almost every day and we talk about the news, life, and of course, percussion. There are some truly great people in the percussion studio at RDAM and it is sad that I’ll have to say goodbye to them, but we’ll at least be able to keep in touch over Facebook and such. I probably know some of the Danes here better than I know some of the Americans at DIS! DIS: Have you practiced and rehearsed differently at RDAM than you would at home? R: I can confidently say that I have practiced much more at RDAM than at my home university. However, the reason is merely that I have more time to do so. At home, I was taking 18+ credits, working part-time, and involved in various clubs and organizations. Upon returning home, I hope to decrease my workload to allow for more practice time because I have really enjoyed all of the hours I get to spend playing music. C: This semester at RDAM has been ‘freeing’ in a sense, in terms of how I practice here. I’m taking three courses at DIS which meet every week, and my two repertoire courses at RDAM meet almost every week, but the individual lessons only meet every two or three weeks depending on the professor. It’s actually quite a relaxed schedule compared to what I’ve become used to in the past two years. Having fewer classes this semester has changed practicing in that I have more hours to practice and I can choose which hours of the day or night work best for me to practice. I’m working on a few duo pieces with Rashaad, so this schedule has also made it easier for us to schedule rehearsal time together. DIS: Have you learned any new techniques as a result of learning from Danish instructors? R: I would not say that I have learned new techniques; rather, I have been exposed to different approaches, viewpoints, and opinions. For example, my private marimba instructor has taught me to be very mindful when producing sounds and phrasing musical ideas. My private timpani instructor has really strengthened my ears (in terms of hearing correct pitches and intervals) and the independency between my hands and feet. C: The great thing about studying music is that it is a very personal and emotional art form, so everyone involved has their own unique way of thinking about music. That’s one of the greatest things about studying abroad and one of the leading reasons why I chose to do so. Understanding the different perspectives of people in Denmark has not only given me a new way to think about certain concepts, but has also at times shown me how similar American and Danish musicians can be even though we are thousands of miles apart. For instance, Johan Bridger has this excellent approach to the marimba where he is always aware of the way each note sounds in relation to the other notes. He understands the physics of the instrument and uses that to his advantage to shape phrases in different ways – making smooth, legato lines or sharp, staccato passages. He also adjusts his playing based on the type of room he is in so that the marimba makes the best possible sound for the audience to understand the music. Another big thing I’ve taken away from my lessons with Per Jensen and René Mathiesen this semester is how to approach percussion in a more relaxed manner. Not that I was incredibly tense before, but being relaxed when you play is certainly an easier way to get a better and more consistent sound when playing your instrument, which is of course important if I have any hopes of playing professionally! While I have been familiar with some of the concepts I’ve discussed with professors this semester, it is an incredible opportunity to hear the different ways each of them think about music and how those relate to my professors in the U.S. It is such a relief when there is a concept or technique I have been struggling with, and when I get to see it from this new point of view, it is like the clouds have parted and I can see clearly. DIS: You will be preforming on November 29th at RDAM for an end-of-semester concert. Are you looking forward to the event? R: I am very much looking forward to the performing at the DIS concert. I love performing whenever the opportunity arises. It won’t be my first concert – I will be performing with the DKDM Big Band the day after Thanksgiving, and with my host father a week before that. Performing music is my passion. DIS: What are you most proud of showcasing from your semester’s work? R: I am looking forward to performing a very physically demanding marimba solo that I started learning at the beginning of the semester. This will be the first marimba solo I have performed with the application of my Danish instructor’s insight and ideas. C: I’ll be playing a couple Danish snare drum solos I’ve learned this semester. While I like all aspects of percussion, I think my favorites are drum and multi-percussion pieces. By playing these solos I’ll be able to a) play an instrument I love and b) play the music of Denmark! It should also provide a contrast to the rest of the program. There are seven DIS students studying at RDAM this semester – two cellists, a pianist, a vocalist, a composer, and Rashaad and I. I know Rashaad plans on playing a marimba solo, and we are playing a marimba duo together, so by playing some snare drum solos I’ll be able to give the audience a glimpse of another side of the percussion family. 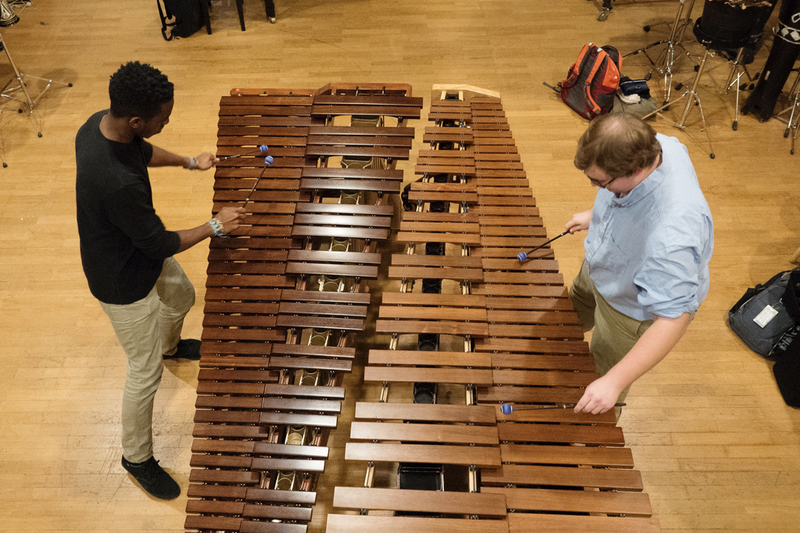 The duo Rashaad and I plan on playing is “Nagoya Marimbas” by Steve Reich. We have learned a lot about playing as a duo together this semester. We listen to each other not only more but with a more focused ear, we feed off each other’s energy more too. It has been nice being able to work with Rashaad this semester and know that we will be able to take what we’ve done together as a duo back to the U.S. since we study together at Vanderbilt. DIS: Is there anything else you’d like to share about your experiences this semester? C: Rashaad and I have been working on a duo concerto to enter in Vanderbilt’s concerto competition in the spring. So, it’s been nice that we both chose to study at DIS and RDAM this semester so that we had this semester to learn the piece. To sum up my experience at DIS and RDAM this semester, it has been incredible. I’ve learned a lot about myself and music this semester, and I’m fortunate to have made great friends in my colleagues and professors at RDAM.